Welcome to HOST! Are you thinking about studying here? Or are you interested in a period of study or internship abroad? Are you a university lecturer or staff member who would like to find out more about staff mobility as part of research, teaching or professional development, or about starting an international university partnership? Then HOST International's service ist just what you have been looking for! On the following pages we provide you information about our University's international relations. Applications for studies starting in the coming summer semester 2019 can be submitted until December 31, 2018. All further information can be found here. We are delighted that you are interested in coming to HOST to study, do an internship or participate in a summer school or for a period of teaching, research and continuous development. 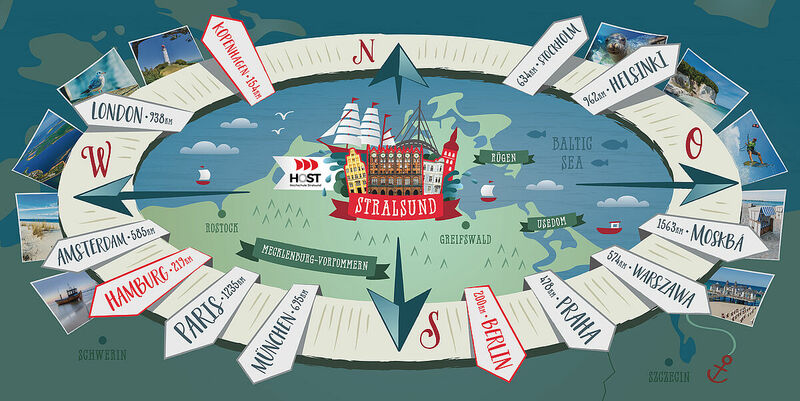 We are pleased in providing you with information about our German and English offers for international students and university staff and show you what living is like in the uniquely beautiful UNESCO World Heritage town of Stralsund, right at Baltic Sea coast. Getting to know other cultures during a period of stay abroad is an unforgettable and enriching experience to make. Whether studying, doing an internship or working abroad, your stay abroad will allow you not only to improve your language and intercultural skills, but also your expertise and your professional and personal network. That's all a considerable asset for your CV - an asset for your whole life! The Incoming Coordinator at the International Office, is the first point of contact at HOST for international study applicants. The Incoming Coordinator provides information and looks after you prior to, during and after your period of study or internship at our University. The Incoming Coordinator is responsible for your admission for a study place. Students from abroad receive support for preparing and organizing their studies and for social integration in the University town of Stralsund. The Outgoing Coordinator at the International Office helps students at HOST to plan and organize periods of stay abroad and advises them about financing opportunities. She holds regular information events. Our tip: arrange for an individual first consultation about 1.5 years prior to your planned departure. The accountant supports the head of international office as well as the outgoing and incoming coordinators. Especially in the fields of financing and documentation of the programs that are managed by the international office. Our teacher of German as a Foreign Language is responsible for the students who come to HOST as part of the exchange program with Hefei University in China. This includes a German Intensive Course, exam preparation for the DaF exams as well as the organization of regional excursions.